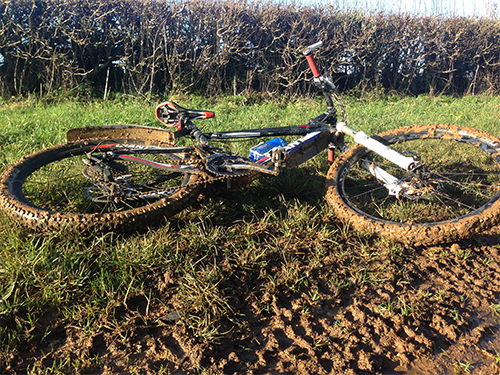 The joys of bike cleaning… Winter biking can kill your pride and joy, or rather if you leave your bike mouldering in a damp shed under several inches grit and slime every time you get back from a ride, then you will kill your bike. 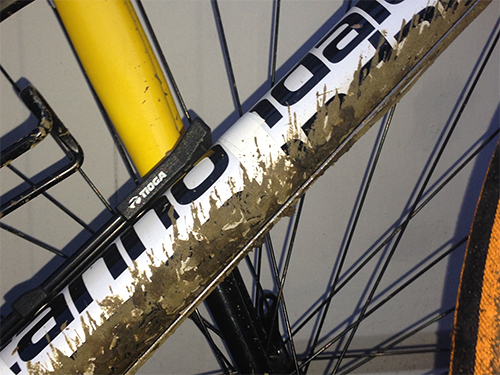 Most bikes will shake off no end of truly atrocious inclement conditions while you’re out on it, and it will keep on working for you despite the rain and mud, but you need to repay the favour when you get back home and treat it to a proper clean. So, regardless of how cold and miserable you think you might be feeling after a winter ride, just bite the bullet and accept that you’ll be standing around outside for another 15 minutes while you clean your steed – think of it as part of the ride. On a positive note, I’m not talking about a particularly intensive scrub, all you need to do is spray the mud off of the frame and moving parts, use a brush to get round the wheels and hard-to-reach areas, and then give the chain and derailleurs a quick GT80 spray. It’ll be enough to save your bike from much of the corrosive power of the winter – my Giant Anthem is testament to this approach, looking nearly as good as new despite a hard life. The only thing to bear in mind is that you’ll also need to find another 10 or so minutes before the next ride to re-lube your bike, as the chain especially may well be a little stiff after the wash. Wheels and hubs – Water has a nasty habit of penetrating any bearings, even those with seals, but it’s hubs that always seem to suffer the most, probably a combination of wading through too-deep puddles and then using a hose to wash the grime away post-ride. The same can be said of both bottom brackets and headsets (your steering), but they generally suffer less issues than hubs. So it’s worth checking that your hubs are spinning freely, i.e. they still have some grease in them and aren’t rubbing, and also not working loose to give your wheels a wobble. 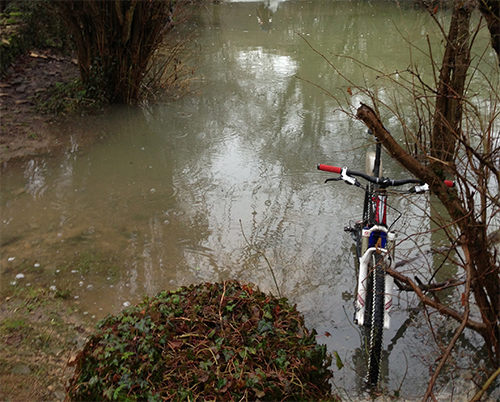 It’s better to spot those sort of problems before a ride, rather than risk any further damage or a mid-ride issue. Tyres – All that mud attracts the sharps out on the trail and conceals problems, so again it’s worth checking your tyres for thorns or sharp stones stuck in the tread, and to look for any obvious tears or the like. Brakes – Muddy water swilling around your brakes adds to the wear on your pads, so another easy check is how are the pads wearing? Cables – Getting some lube into your cables every now and then, not only helps them to run more smoothly, but also penetrates the housing and forces out some of the water. Lubing cables can be a real faff, but it’s definitely worth finding the time to do at least once during the winter. It may be the last thing you want to do when you’re cold and wet after a ride and longing for some home comforts, but trust me, your bike will love you if you find a few minutes to keep it clean… and it’ll be less likely to let you down on the next ride when you’re battling the weather miles from home.